Original Christmas plays at Yellow Tree Theatre have become a beloved tradition in the last 9 years. Due to a happy accident, Yellow Tree was forced to produce their own play (written by co-founder Jessica Lind Peterson) when they lost the rights to the play they were intending to do their first season. This was the basis of the plot of that first play, Miracle on Christmas Lake, which after three successful runs inspired a sequel Miracle of Christmas Lake II that also ran for a couple years. Then came A Hunting Shack Christmas, and now this year we head to the icehouse for A Gone Fishin' Christmas. All of these plays follow a similar blueprint - a small Minnesota town with adorably quirky characters, the "citiots" who return to the small town they grew up in and make some sort of a life change. It's not the most original of plots, but it works, and provides a framework for Minnesota humor, outrageous antics, and lovely quiet moments of family and connection. 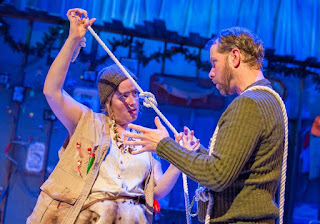 There's a reason that Yellow Tree's original Christmas plays are so popular and sell out virtually every performance - they are a perfect mix of heart and humor wrapped up in local jokes that we love so well, with a talented cast that makes these characters and the sweet and silly story sing (literally and figuratively). And Gone Fishin' may be the best of the bunch. A few tickets remain (with best availability at weekday matinees) so get your tickets now to experience this hilarious and heart-warming tale. The central conflict of this play is between two sisters from Duluth (from whence, coincidentally, the playwright also hails). Cassie couldn't wait to leave town as soon as she finished high school (as seen in a couple of flashbacks, charmingly labeled so by a sign that pops out of the hole in the ice) and is now a TV news reporter in the Twin Cities. She returns to Duluth, green intern Misha in tow, to cover a story on the Christmas ice fishing competition. Scheduled to interview her father who's supposed to be competing in the contest, she shows up at the family icehouse on Lake Superior to find him out of town and her sister Katie there instead. The two sisters could not be more different; Katie has, let's say, embraced her natural earthy side, retreating into the culture of the place they grew up in as much as Cassie has run from it. Decades of family tension fill the air, and the drama builds as Cassie's ex Eric, who has stayed in town to run his dad's bar, unexpectedly shows up. A sudden shift in the ice sends the icehouse and the little group inside floating free on the big lake, until Coast Guard (and Katie's crush) Anders stages a brave rescue. Trapped on a floating island of ice, fishing gear, and memories, Cassie is forced to reconnect with what she's been running away from for years - her past, her family, her hometown, her ex, her self. The beauty of Yellow Tree's intimate theater space is that it becomes almost immersive; you're totally in it with the cast and the rest of the audience for the shared experience of live theater. Especially when you're sitting in the front row, as I was (warning for front row dwellers, you might get an extra special surprise at the end of the show, whether you're ready for it or not). In this small space you can clearly see the emotions on the faces of the actors, so close that at times it seems like they're in danger of falling off the stage and into your lap. The set looks so real and detailed you're tempted to climb on up and explore. Being a citiot myself, I've never actually been in an icehouse, but this is what I imagine one would look like (only less claustrophobic). The elevated stage is the ice, with a fishing hole cut into it from which various objects (and people) emerge and disappear. Fishing gear and other interesting details cover the back wall and are strewn around the surface of the ice. Costumes range from the chic city wardrobe to plaid shirts to Katie's furry native-inspired gear (set design by Katie Phillips, costume design by Morgan Potter). 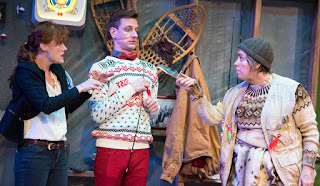 Everyone in the five-person cast (two of whom are based in Duluth) is so playful and fun to watch as they bring out the quirkiness and the humanity of their characters. Director Jason Peterson strikes the perfect balance between the silly and the serious; often just at the most touching moment when the tears begin to fill your eyes something happens to make you laugh out loud, the most delicious mix of emotions. Making her Yellow Tree debut, Sandra Struthers (who bears more than a little resemblence to the playwright) is a wonderful Cassie, confident yet conflicted. Returning Yellow Tree favorite Mary Fox* is, as always, hilarious as Katie, putting everything she has into going for the big laugh, and always getting it. Duluth-based Zachary Stofer* is a welcome addition to the Yellow Tree family as Eric, the one that got away, and also provides a nice musical moment singing the original song "A Letter to the Author" (see video below). Blake Hogue is quite the scene stealer as the intern and aspiring meteorologist, closing the show with his "weather rap-port." Rounding out the cast is Matt Wall as the affable hometown hero Anders. 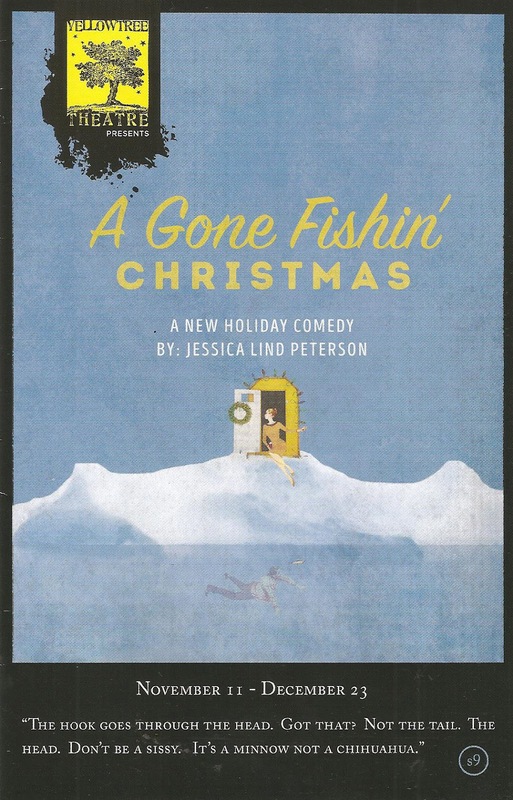 A Gone Fishin' Christmas, along with YTT's other original Christmas plays, nicely explores the very real conflict between rural and urban Minnesota, something I have experienced first hand. Both of my parents are the only ones among their siblings to have left the small towns of their birth to move to "the Cities." Returning to those small towns for holidays, my sister and I are definitely viewed a bit differently as the only cousins from the Cities. You need to look no further than the map of how Minnesotans voted in the recent election to see that there's a growing divide between outstate Minnesota and the metropolitan areas. I find this concerning, and worthy of a much larger conversation than is possible here. Not to sounds too trite, but maybe if we were all forced to spend a few hours in an icehouse floating on Lake Superior, we might also discover we have more in common than we think. Yellow Tree Theatre has done it again. Jessica Lind Peterson has written another modern Minnesota classic, this one with obvious affection for her hometown of Duluth, which she refers to "Paris with less baguettes." This allows for not just Minnesota references (what's not funny about lutefisk), but even some Duluth specific references (such as Bent Paddle Brewery and local band Trampled by Turtles). This wonderful cast and creative team have beautifully, hilariously, and poignantly brought this uniquely original Minnesotan to life on Yellow Tree's intimate stage in a fun, playful, and touching way. It's one of those plays that touches you, makes you laugh until you cry, and leaves you with a warm feeling inside. Sweet but not sappy, outrageously funny but not offensive, it's everything we love about Minnesota and the holidays. 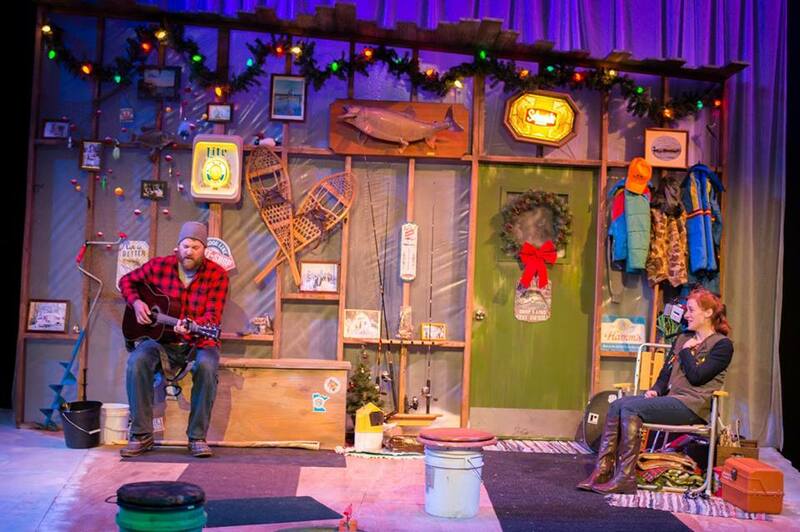 If you've never seen a Yellow Tree Christmas play before, get thee to Osseo for A Gone Fishin' Christmas continues before it closes on December 30! And if you have seen one or all of them, this one is another gem and maybe even my favorite of them all (until next year). Watch this video for a peek at a few crazy and heart-warming scenes from A Gone Fishin' Christmas, accompanied by the original song "Letter to the Author" sung by songwriter Blake Thomas* (the only songwriter I know who can rhyme lutefisk with ludicrous in a such a sweet and quirky way that it makes you smile while bringing a tear to your eye). 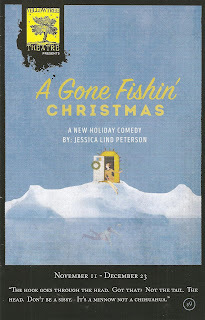 A Gone Fishin' Christmas Trailer from Yellow Tree Theatre on Vimeo. *For more Duluth-based humor, music, and storytelling, listen to Blake Thomas and Mary Fox's radio show Take It With You, which also features Zachary Stofer. Seasons 1 and 2 are available now free online for your listening pleasure, and the recently completed Season 3 will be uploaded soon. And if you happen to find yourself in Duluth on the third Tuesday of the month sometime next year, go see it recorded live at the Underground.